The Pacific Crest Trail Association and U.S. Forest Service invite you to the North Cascades Saw Training and Certification events. Qualified participants can earn crosscut certifications and re-certifications, as well as chainsaw re-certifications. These saw trainings are possible thanks to safety and operation agreements with the U.S. Forest Service. These events are open to PCTA volunteers and members only. The PCTA saw program only certifies sawyers for bucking operations. Copies of current First Aid and CPR certifications must be presented to attend PCTA saw certification events and 297 Chainsaw Practicum classes. The application process is very competitive. Submitting your application does not guarantee admission into the training. Learn more about PCTA’s Saw Training and Certification program. When and where are the 2019 events? 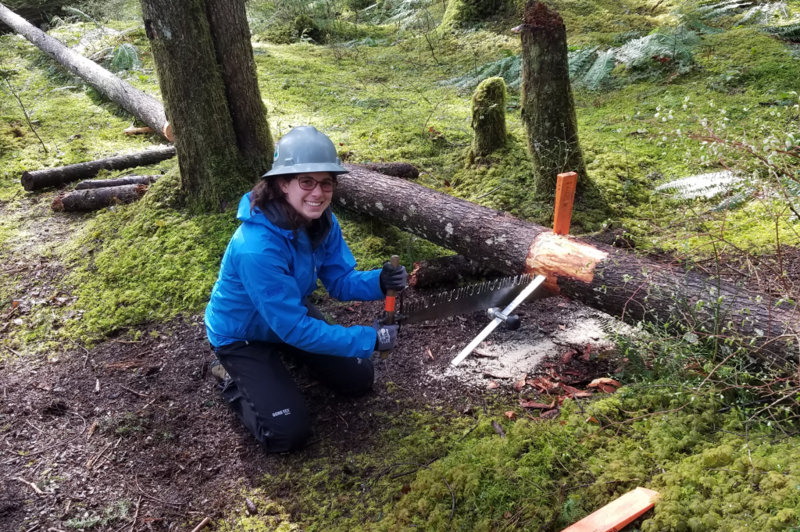 April 13-14: Crosscut certification and chainsaw re-certification in Randle, Wash.
May 4: 103 Basic Saw Crew Training in North Bend, Wash.
May 4: 297 Chainsaw Practicum in North Bend, Wash.
May 18-19: Crosscut and chainsaw certification in Darrington, Wash. Initial certifications for chainsaw sawyers are not available at this training. Self-contained RV and tent camping will be available for participants. There is also limited bunkhouse space available (first come, first serve). Meals are not provided at this certification event, but there is a kitchen in the bunkhouse that all participants can use to prepare meals. Please note: The PCTA saw program only certifies sawyers for bucking operations. Copies of current First Aid and CPR certifications must be presented to register. These trainings will happen simultaneously, so students can only participate in one class on May 4. Each training is a full day. PCTA is not arranging camping or meals. Registration is required and limited. Those registering for 297 Chainsaw Practicum must have current First Aid & CPR certifications. Email [email protected] to register. Registration is required and limited. Register now. Do I need a current First Aid and CPR card? A current First Aid and CPR certification is required for a saw certification to be valid. PCTA staff and volunteers cannot operate chain or crosscut saws unless they hold a recognized and valid sawyer certification, First Aid, and CPR card. If a current First Aid and CPR card is not on file at the PCTA Sacramento office prior to the training, your registration will be terminated and you will be unable to attend. How do I register for these events? Online registration for all saw events will be available on this website, coming soon. Please forward questions pertaining to North Cascades Saw Training and Certification events to [email protected].